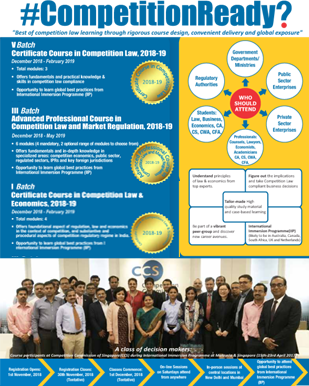 The 3-month Certificate Course in Competition Law (Certificate Course) entails study of Modules 1 to 3 namely New Paradigm of Regulation and Competition, Legal and Economic Foundation, Completion Law in India & Module 6-Economics and Competition Law during January 2019 to April 2019. The Certificate Course has been designed for professionals who wish to fully grasp the convergence between economics and competition i.e. economic analysis of competition law and its legal implications.